I was impressed by how unique and simple LiveLotto is—but I have several gripes. If you believe the saying "if you’ve seen one, you’ve seen them all" applies to lottery sites, then you clearly haven’t seen LiveLotto. Games like Powerball, Mega Millions, Euromillions, and the like are nowhere to be seen here. Instead, LiveLotto offers an instant-win game where draws are held live, and played right on your PC, mobile phone or tablet. It’s an interesting—and definitely fun—take on online lottery, but it comes with various limitations. For instance, only players from Great Britain are allowed access. Do you qualify? If so, read on to know more about LiveLotto! I like LiveLotto’s unique take on online lottery, but that’s about it. Technically, LiveLotto only offers one type of lottery game—their own. However, they offer 7 iterations of it, each sporting different jackpot amounts. The highest jackpot they offer is £25,000, and offers 4 secondary prize tiers. 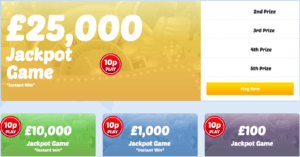 The 6 other games they offer feature jackpots worth £10,000, £1,000, £100, £10, £5 and £1, respectively. Each entry costs 10 pence. One other thing worth noting: you can only purchase a limited amount of tickets, unlike other (traditional) lottery games that let you purchase as much as you want. The limit depends on the jackpot size. For instance, their £1 jackpot game only offers a total of 16 tickets. Once all 16 tickets are sold, any entries purchased after are automatically entered into the next draw. 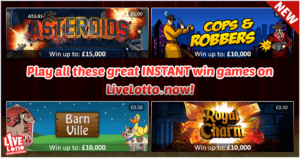 LiveLotto also offers a few interactive instant win games. If you’ve played other lottery sites’ instant win games before—it’s a good bet you’ll immediately recognize LiveLotto’s offerings. These are the same ones that also appear in other sites, like LottoLand, for instance. You can win up to £15,000, with each entry costing 10p—the same price as their main lottery game. Overall, LiveLotto’s instant win games are a good addition to their repertoire, especially if you’re itching for a more interactive experience. Compared to other lottery sites, LiveLotto’s banking methods are pretty disappointing. In fact, LiveLotto only accepts 3 payment methods: Visa, MasterCard and Maestro. Yes—these payment methods are quite popular (maybe even more so in Great Britain), but having more options is always better. What if a player doesn’t use any of these methods? They’d have to sign up for these credit cards just to play at LiveLotto—and that’s an extra step that not all players will bother to take. One more important note: LiveLotto imposes a £5 minimum for both deposits and withdrawals. The only exception to this is if you (or the company itself) are closing your account. I give LiveLotto two thumbs up when it comes to security. Like other legitimate lottery sites, LiveLotto ensures player data is secured by utilizing 128-bit SSL encryption. More than that, they don’t store your credit or debit card details, so even if hackers make their way inside LiveLotto’s system, you don’t have to worry about your details being compromised. In addition, they use Paypoint and Barclaycard to process all payments. On top of that, LiveLotto is also regulated by the UK Gambling Commission so you can be sure they adhere to certain standards. All draws, meanwhile, are randomly generated and all games are, for the sake of fairness, independently tested. Finally, the RNG (random number generator) they use has been tested by a third party (iTech Labs) and has been certified by eCOGRA. LiveLotto’s support is nothing special—but it’s not terrible, either. For self-help purposes, LiveLotto’s FAQs do a good job of explaining LiveLotto’s unique mechanics. But if you have a question not covered in the FAQ, you can reach them quite easily. LiveLotto’s customer support agents can be reached via email or phone from 9:30am-5:00pm every Monday to Friday. Unfortunately, they don’t have a live chat option—which is a shame. As I’ve said before, LiveLotto’s unique process makes it one of the easiest lottery sites around. The app itself is very user-friendly and doesn’t really take a genius to figure out. The website version is similarly easy-to-use—just click on the blue computer icon at the top of LiveLotto’s site and wait for the program to load. Easy. Whenever you play LiveLotto’s games, you are also helping out a charity. Some 20% of all ticket sales are funneled directly to St. Catherine’s Hospice—a charity that helps improve the quality of life of those who have been afflicted by serious illnesses. Currently, that’s the only charity that LiveLotto contributes to, but in the future, I imagine the list will become longer. Of course, even if the list doesn’t grow, what LiveLotto is doing is still a huge deal. Every bit of help goes a long way, after all. Due to its unique process, signing up with LiveLotto differs from most lotto sites. It’s quite easy though! Download the LiveLotto app on your iOS or Android device. Alternatively, if you don’t want to play on your mobile device, you can also play on your PC or laptop. Once you’ve got the app/program running, simply take a picture of your face, upload it, and complete the account setup. Incredibly easy right? Now for the fun part! You can go from sign-up to playing LiveLotto’s lottery game seamlessly—it’s that simple. Once you’ve uploaded your face and set up an account, simply pick the jackpot or game you want. Choose how many entries you prefer. You can do so manually or via the Quick Pick option. As you can see, the process is much easier, and certainly faster, compared to other lottery sites. It’s a fun, fresh take on the online lottery formula! There’s one big caveat though: LiveLotto is only available to players residing in Great Britain and must be physically there upon entry into their lottery. If you live elsewhere, you won’t even get access to their website—let alone their mobile apps. It also goes without saying that you must be of legal age (16 or older) to play. I liked how LiveLotto makes things easy for winners—no need to travel far or jump through hoops. 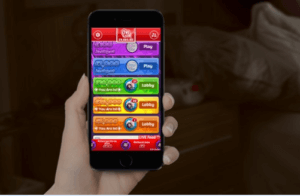 As their name suggests, LiveLotto draws are played live right on your mobile device or computer, so you can immediately see whether you win or not. However, if you happen to be absent during a live draw and you end up winning, LiveLotto will send you an email. Also, if you are using an iOS or Android device, a push notification will be sent to you informing you of your win. If it is indeed your lucky day, LiveLotto immediately transfers your prize to the payment method you registered. Depending on you bank, however, it may take as much as 10 working days for the transaction to clear. It’s also worth noting that for withdrawals exceeding £2,000, payments will come in the form of checks. There’s a lot to like about LiveLotto’s unique instant win format—but it’s not for everyone. If you want a more traditional online lottery experience, then these three should scratch that particular itch. They offer a massive selection of real lottery games. theLotter is king when it comes to traditional, solo play lottery games. Currently, they have 53 games on tap—including the most popular and lucrative ones like US Powerball, Euromillions, Mega Millions and more. They also offer around 24 scratch cards, as well as some raffles every now and then. They accept more than 3 payment methods. No need to limit yourself to using Visa, MasterCard or Maestro—theLotter accepts over 29 different payment methods. That said, like most lottery sites, the ones that you can use depend on your location (because some aren’t available in certain countries). Accepts players from various countries. Lotto lovers from all over the globe can play here—with a few exceptions, like the US. Still, it’s not exclusive to Great Britain players. They offer a wide array of games. WinTrillions may not come close to the massive game selection of theLotter, but they do offer a melting pot of various types of lotto games. You can choose between 20 solo play lotteries, 13 syndicates, and even several millionaire raffles. Their banking methods are excellent. WinTrillions’s banking methods are impressive as well. Players are given 32 options—from the usual suspects like Visa, MasterCard and American Express, to Bitcoin and a lot more. Single draw purchases aren’t allowed. One of WinTrillions’ biggest drawbacks is that they don’t allow players to purchase tickets one draw at a time. You can only buy tickets for multiple succeeding draws, which tend to drive up the price. Game selection is quite good. There’s 19 solo lottery games waiting for you, along with a few syndicates and millionaire raffles. They accept various payment methods. They don’t accept as much as theLotter of WinTrillions, but they do accept 7 more banking methods than LiveLotto. That means they accept a total of 10. They make prize claiming easier and more convenient. Like LiveLotto, LottoKings makes prize claiming much more convenient for winners. If you win the jackpot, you can give LottoKings the power to claim it on your behalf—handy, if you don’t want to travel to another country. You can then ask them to send you a check or, if you want, you can claim your winnings at the nearest LottoKings office. LiveLotto’s rating depends on what you’re looking for in a lottery experience. 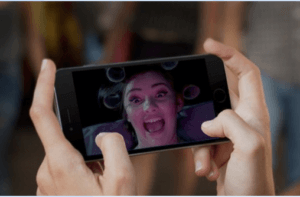 If you live in Great Britain and want a fresh new take on online lottery that is cheap, easy and can be played anywhere, and on almost every device, then LiveLotto just might be in your wheelhouse. However, if you want a meatier lottery experience—one that involves official lotteries offering huge jackpots—then LiveLotto’s simple but unique approach might be a tad too limiting. LiveLotto is a fun way of making some money—but it may be a tough sell for serious lotto players. 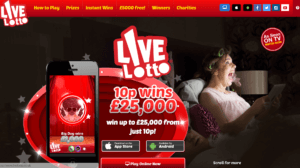 Operated by Beda Leisure and licensed as an External Lottery Manager by the UK Gambling Commission, LiveLotto is a unique online lottery site. Unlike others in the industry, LiveLotto doesn’t offer any official lottery games. Instead, they offer a unique instant-win game that holds live draws right on your PC, tablet, or mobile phone. LiveLotto is exclusive to players living in England, Scotland, and Wales.